New Insert for my Craig Young Palette - the Paintbox. For some time I've felt that the 16 well insert for my Paintbox is not ideal for me. Recently I asked Craig to make me a 24 well insert to replace the current 16 wells. It arrived by post today. My well-used Paintbox with new 24 well insert. I'm not a limited palette person. I like as many options as possible and paint a range of subjects that often require different colours. Not for me the half dozen or even dozen paints of the limited palette. Many will disagree with my approach but plenty will agree and I think in general there is a tendency to have more paints available rather than less. I've had the above palette for some years now and seeing Charles Reid's paint box at Stow this year prompted me to do something. See the small amounts of paint in each well. Charles recommends you squeeze out fresh paint each day you paint. The above is the normal 16 well palette and each well can hold a considerable amount of paint - far more than is needed for my` first try for a finish' Reid approach. I rarely achieve this `first try' thing but that's another matter! The new wells are smaller - obviously - but will still hold a lot of paint and unless you use wide flats or very large rounds are perfectly adequate. I've modified my current insert by sticking in some half pans and count 28 (!) but that can be cut down, and the next task is to carefully consider what paints to make up the palette. The first dozen or so are fairly obvious but it then gets trickier. I do hedge my bets in that I have a secondary small palette with 12 additional paints but I think that will also have to be pruned. I'm not rushing things as I'm still stuck in the moving house problem but will report further when this is resolved and am settled in my new painting abode. After the mixed - very mixed - response to my Beaver Tail portrait I thought I'd try another this week. The subject is Chief Washington of the Coquilles, who took part in the Rogue River War in the Pacific Northwest. The guide photo shows him with a very bitter expression. I suspect it was taken against his will while in captivity. 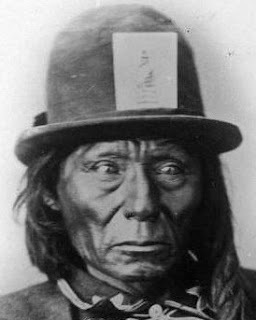 When I `googled' him all I got was a reference to a `Chief Seattle', who was obviously a different person, but referring to a book called `Indian Wars of the Pacific Northwest' by Ray Glassley, there were two short references. Before starting our AVA leader Yvonne suggested I try to impart more colour into my Indian portraits rather than copy the rather dull sepia monotones of these original photographs which she thought were inclining to look `dirty'. Yvonne suggested I find some colour photographs of Amerindians so I get a better idea of the skin colours. My friend Hap always says mine are not dark enough. In view of the comments I've had I thought it worthwhile to show the guide photo - very, very dark. I think you can easily see the colours I've introduced, if you compare it with the previous portrait, which include brighter yellows and Quinacridone Burnt Orange (Daniel Smith PO48). I also used more Cadmium Red mixed with a little Raw Umber for the skin tones, Cerulean or Cobalt Blue to darken , and Translucent Brown (Schminke PBr41). The hair is various mixes of Ultramarine Blue with either Translucent Brown or Burnt Sienna. It is on the rough side but I persist in my creed of `being cruder' espoused by Charles Reid. This will make the perfectionists blanch but I will keep trying if still some way from producing work I am completely happy with. My wife took one look at it and said she preferred the previous one! This was very much experimental and I shall have to ponder how to approach the next one. Brushes used were the Isabey retractable Size 6 for the facial detail and the Escoda sizes 8 and 10 Kolinsky retractables for the rest. When I posted Beaver Tail a comment by Ray was that the finished painting had lost something compared to the earlier stages. Yvonne agreed so I thought I'd play about with it and see if I could address that problem. Beaver Tail - Corrected Version. My friend Hap from near Seattle in Oregon knows many Native Americans and always says my skin colour isn't dark enough. My `corrections' are on the crude side but that is deliberate. The main colour loaded on was Schminke Translucent Brown (Pbr41) with some Cerulean and Ultramarine Violet PV15) either Graham or Rowney.. The Schminke is a great colour and could easily replace Burnt Sienna. What do you think? Is it better or worse. I'm not sure although I agree the first version is on the dull side. Labels: Beaver Tail, Schminke Translucent Brown. Avon Valley Artists and Beaver Tail. I imagine many will wonder what this title means. In a nutshell it was the latest AVA session and I painted an Amerindian called Beaver Tail. Fourteen present today, which is almost as many as we get with the official programme. We have two more weeks of `do it yourself' painting then the official programme starts. Yvonne and Jan have just returned from their highly successful ten day exhibition at Wells Cathedral, where combined sales of framed and unframed paintings exceeded 60. The last portrait I painted was at Stow with Charles Reid. That was in May. Problems and distractions since then reduced my painting time considerably but I did attempt one last week - unfortunately a disaster on hot press paper. My normal policy is, rather than brood about failures, to go straight back in and it usually works - at least I think so. This week I attempted to paint an Amerindian called Beaver Tail, an Assiniboine Indian as photographed by Edward Curtis in 1908. I began with a careful but not over detailed drawing, taking measurements to ensure things were in the right place. For this I used a mechanical 07 pencil with 2B lead. You can see the sequence of events so I won't elaborate. The actual painting is a little darker than it appears on here, especially the shadow areas where I added a second wash. I'm sure Hap will say I haven't got the skin colour right but on this occasion I just wanted to get the show on the road again. I'll do better next time Hap. Colours used were limited. Cadmium Red Light, Raw Umber and Cobalt Blue for the skin colours. The hair Ultramarine Blue, Burnt Sienna and Raw Umber. His clothing Raw Umber. The cap is Raw Umber and Raw Sienna. I used three brushes. Escoda 1212 retractables sizes 10 and 12 plus the Isabey retractable size 6. Oh and by the way these are claimed to be the first watercolour paints than don't utilize the hardening agent silicium dioxide. Almost lost for words after that lot I don't quite know what to say - at least when I get my voice back!. See my piece in March about these paints and what others on Wetcanvas had to say about them, including an analysis of the pigments used and lightfastness tests by the artist Chris Beck. To summarize there are 90 (it says 89 in another place) colours and Great Art prices, in 5 series, start at £2.10 up to £4.35. I doubt I'll buy them but I'm sure many will attracted by the prices and marketing blurb, and we know a great many artists, not just amateurs, don't have a clue what paints are made of accepting what it says on the tin. Am I being cynical? What other offers are there for watercolour artists from Great Art. Apart from this incredible offering - and I don't mean incredibly good - we have Schminke watercolours at up to 50% off, Clarefontaine and Canson Montval paper, DaVinci squirrel brushes all at reduced prices plus other bits and pieces. Free delivery if you spend over £39.95p.. Despite all the background noise and current distractions I have managed to do some painting recently, although rustiness is evident. I read somewhere that in order to maintain your current standard you need to paint at least three times a week, and in order to improve more than that. Having done very little painting since late May I know the feeling. A while ago my friend John Softly sent me some photos of boat scenes at Staithes in North Yorkshire. John has become friendly with the artist Robert Brindley who supplied them. I hope Robert won't mind me using them as guide photos and acknowledge him as the source. What attracted me was the red boat. It was a very misty scene and the background was only hinted at. Apart from the red - a mixture of Cadmium Red Pale and Translucent Orange (Schminke PO71),with Cerulean on the other boats, most of the background has various greys, quite a bit puddle colour, the bane of my guru Charles Reid. Raw Sienna and Raw Umber also feature. The greys primarily from Ultramarine and Burnt Sienna. It is on the crude side but here I am following my guru who often says on his workshops `be cruder', aimed at preventing fussy over detailed paintings. This one is the latest bird painting for `Paint Colorful Birds for Fun' on Facebook. The Puerto Rican Spindalis. 16" x 12" Fabriano Artistico Extra White 300 gsm Not. As you can see a colourful subject. Colours used were Translucent Orange (Schminke PO71), Gold Ochre (W & N PY43), Cerulean, Ivory Black and ? I have also started on another Indian portrait. Actually I did one at Thursdays Avon Valley Artists session but it was a bit of a disaster. It was of an Amerindian called Chief Washington. I'm sure I've read about him in one of my books but a search on Google came up with nothing. I used hotpress paper as an experiment. I really was much too careless, just wanting to get back to painting, and I shall have another shot at him soon taking much more care - and using cold press paper! The previous portrait I did was in May at Stow so this emphasized the need to keep ones hand in. A replacement for PY153, New Gamboge, Indian Yellow etc? In 2012 the popular pigment PY153 Nickel Dioxine Yellow was discontinued, no doubt because of lack of demand from the chemical and/or auto industries. As has been pointed out previously makers of watercolour or other types of paint are very much at the bottom of the pile and have to take whatever is available. Although not offered by a huge number of paint makers PY153 was the pigment used by both Winsor & Newton and Daniel Smith for the popular New Gamboge paints. Both have already reformulated with a multi pigment mix. In addition Rowney and one or two others called it `Indian Yellow, supposedly a replacement for the notorious original Indian Yellow. Why notorious? It has been said, and repeated many time, that this paint was made in a vile process by feeding cows in India with certain types of leaves, that turned their urine yellow, and this was the foundation of the paint. Although this story has been repeated many times I, in my capacity as a (very) amateur historian, researched the story and discovered that it might all be nonsense with no real basis in fact. The Rowney Indian Yellow is a staple in my palette so I have to decide at some stage on a replacement. I still have a full tube so this isn't urgent. Handprint claims several orange-yellow and yellow-orange paints make adequate replacements but basically plumps for three, PY35, PY65 and PY110. Before I continue you will find that several paint suppliers still list PY153 and may continue to do so. Can you trust the labelling? Possibly but I have my doubts and in fairness one can't expect a manufacturer to immediately change the labelling for just a single paint. I notice that Winsor & Newtons new style bare metal tubes appear to have the information printed on them so that may mean they can change details quite rapidly. Winsor & Newton have also said that their usage of pigments is so large that, when a pigment is discontinued, they run out quite rapidly. The left swatch is Indian Yellow from Rowney. The two middle swatches are Permanent Yellow Deep (PY139) from Maimeri and Venezia respectively, while the right one is Cadmium Yellow Light ((PY35) from Lukas. The closest appears to be the Lukas paint but, being a Cadmium, is opaque and also toxic. The two Maimeri paints appear more orange. Neither PY65 or PY110 are (as yet) widely available but PY65 is listed by W & N as Winsor Yellow Deep, also by DaVinci as Hansa Yellow Deep and Arylide Yellow Deep. Daniel Smith call it Hansa Yellow Deep. So far PY110, which is highly praised by Handprint, is only on offer from Daniel Smith and Graham - Permanent Yellow Deep - Indian Yellow respectively. This may change in the medium to long term.. Daniel Smith call PY108 Indian Yellow. What to do? I don't have to change immediately so will ponder the problem for a while. My inclination is to try PY110 maybe from Daniel Smith. Any corrections or additions to the above are welcome and can be incorporated in the text. This week the Thursday session took place, after last weeks abortive attempt, and sixteen members took part. This is informal with everyone `doing there own thing' rather than a fixed subject. Some prefer this but in the discussion that took place afterwards, the consensus seemed to be that the majority favoured a programme with defined subjects. We may not like some of the subjects but it does make you exit your comfort zone. Even the seating is informal! Yvonne Harry at work. This coming week sees the annual exhibition of Yvonne and Jan Weeks at the famous Wells Cathedral - some 130 paintings on show. The painting at bottom left is by Pat Walker, while that at bottom right is by Pauline Vowles. This was mine which was done for the `Paint Colorful Birds for Fun' page on Facebook, the subject being the Barn Swallow. Struggling as I have been recently to do any painting it was a difficult subject and I didn't do it justice -it's another one for the recycle bin - but at least I got some paint onto the paper.